First of all, what on earth is it? I’m tempted to describe it as Twitter done right years before Twitter even existed, but I’m a geek and I’ve been using irc for years. It has a long heritage, but unlike the ubiquitous email it hasn’t made the transition into mainstream use. In terms of usage it has similarities to things like Twitter and Instant Messaging. Let’s take a quick look at this. Twitter allows you to broadcast messages, they get published and anyone who is subscribed to your feed can read what you say. Everything is pretty instant, and if somebody is watching the screen at the right time they can respond straight away. Instant Messaging on the other hand, is more of a direct conversation with a single person, or sometimes a group of people, but it too is pretty instantaneous – assuming, of course, that there’s someone reading what you’ve said. Both of these techonologies are pretty familiar to many. If you go to the appropriate website you are given the opportunity to sign up and either use a web based client or download one. It is much the same for irc in terms of usage, although conversations are grouped into channels which generally focus on a particular topic rather than being generally broadcast (Twitter) or more specifically directed (Instant Messaging). The downside is that in most cases you don’t get a web page with clear instructions of how to sign up, download a client and find where the best place is to join the conversation. There are two things you need to get going with irc, a client and somewhere to connect to. Let’s put that into a more familiar context. The client is what you use to connect with; this can be an application – so as an example Outlook or Thunderbird would be a mail client, or IE, Firefox, Chrome or Safari are examples of clients for web pages – or it can be a web page that does the same thing – so if you go to twitter.com and login you are using the web page as your Twitter client. Somewhere to connect to can be compared to a web address, or if you’ve got close enough to the configuration of your email to see the details, your mail server address. Let’s start with the ‘somewhere to connect to‘ bit. 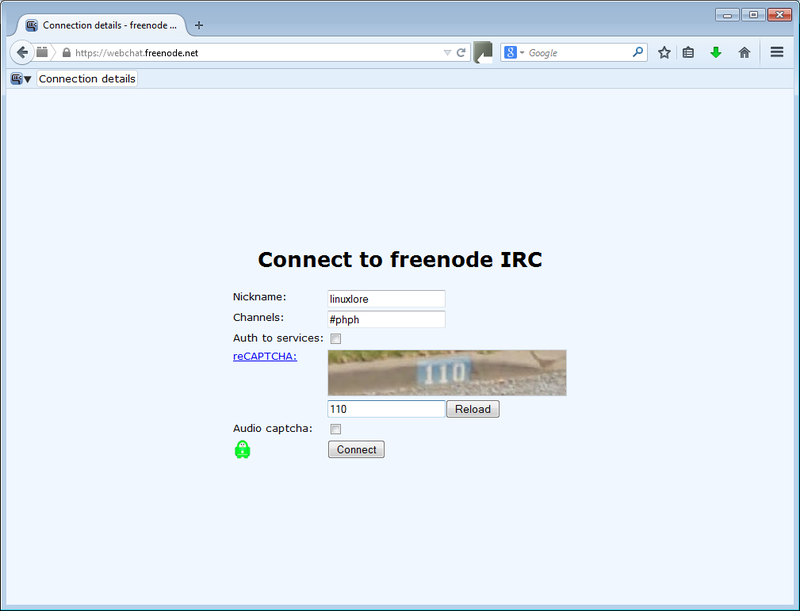 Freenode is one of the most popular irc servers, so let’s take a look. First we’ll see what we can find out from their website, http://freenode.net/. There’s a lot of very daunting information there for somebody new to irc, so ignore most of it and follow the Webchat link on the left. That’s all very well and good, but what do we put in there? I guess the screenshot above gives a clue, but if you actually visit the page the entry boxes will be blank. Well first off there’s the Nickname, this can be pretty much anything you like, no need to register it – stick to the basics of letters, numbers and some simple punctuation (if you want to), keep it short and so long as nobody else is already using it you should be fine; if it doesn’t work try another. Channels is the awkward one, how do you know what channels there are? If you’re lucky you’re looking into this because you’ve been told there’s a channel there and hopefully you’ve been given the channel name. 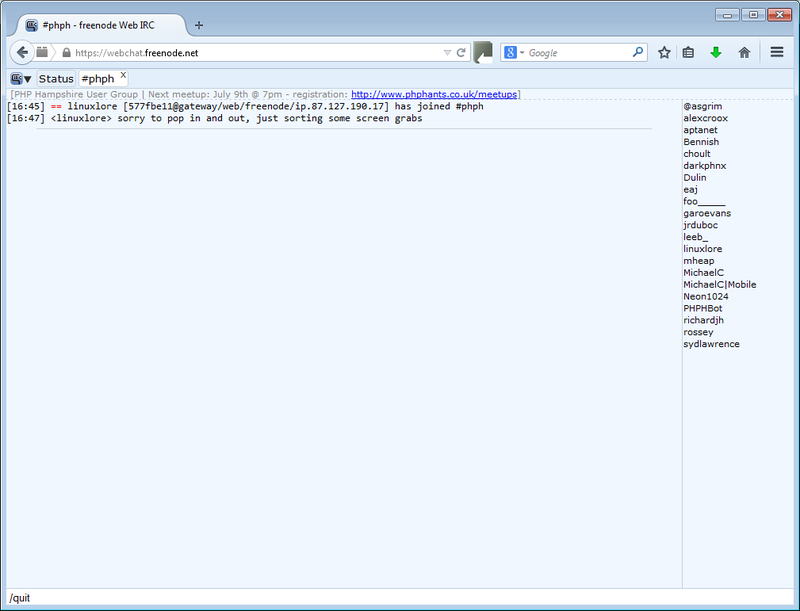 For now let’s just use the PHP Hants channel, so that would be #phph in the Channels box. Now all you need to do is type in the captcha, ignore the tick boxes and click Connect and you are on the irc channel and ready to chat. Down the right you’ll see a list of who else is there, and in the main window there will be a bit of introductory information (e.g. topic for the channel) and depending on how busy it is anything from nothing to a fast scrolling screen of text. If you’ve miss typed there’s a chance you’ll end up in a channel specially created for you because it didn’t exist; don’t worry, just quit and try again (I’ll explain that process shortly). Type it in the entry box, press return and you’ve disconnected from the server. The next thing to look into is using a client program since this is far more flexible, but I’ll save that for another post.